I have a fairy typical setup where I have nginx in front of haproxy, where nginx is terminating the ssl connections from client browsers. 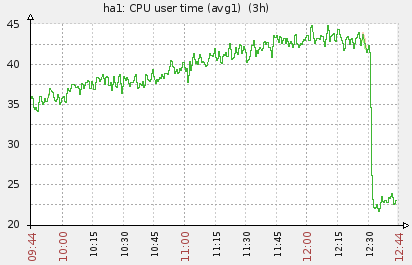 As our product grew, my loadbalancer machines didn’t have enough CPU to do all the required ssl processing. As this zabbix screenshot shows, the nginx takes more and more cpu, until it hits the limit of our AWS c1.xlarge instance. This causes delays for our users and some requests might even time out. If your box can support AESNI you might want to prefer AES over RC4. It’s not the safest cipher choice out there, but more than good enough for our use. Check out this blog post for more information. All done! 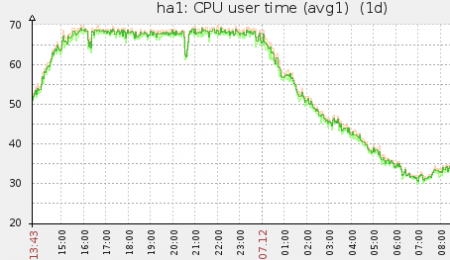 My CPU load graphs also shows a clear performance boost. Nice and easy victory.